“Do what you can, with what you have, where you are.” A quote by Theodore Roosevelt that describes my new project perfectly. Inspired by these words and the need for a monthly focus for myself, I have created a new project that I welcome you to play along with. It has taken me a while to share this here, however you may have received the newsletter I sent sharing the idea. This started as a personal challenge to use what is currently in my cupboards and create quilted items for gifting to others. I started the Project in January with the theme “squares” and we have seen several styles of quilts, and blocks and surprisingly the age old design “Trip Around the World” has been used by many. February the theme was “rectangles in 1:3 ratio” and that has given way to more interesting designs. In March we are playing with “on-point features” and I look forward to what is done with that. This month I have managed to complete 2 quilts that were partly done, and that is very satisfying. Each month I will issue a new theme on my Quilt Therapy Qld Facebook page, or if that is not for you, email me and I can add you to my C to C Project email list each month so you can join in. I send an email at the end of the month with a newsletter of what has been happening throughout the month and announcing the new theme. Follow the simple monthly themes to be inspired into action. 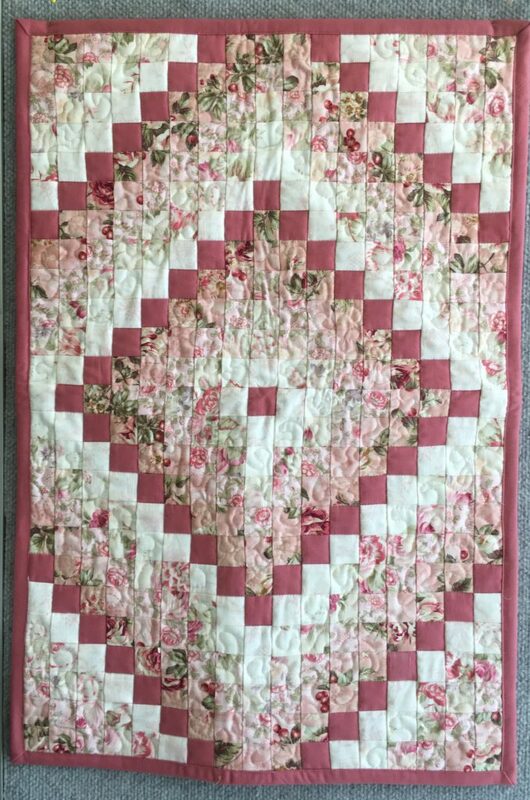 Set an intention of what you would like to do each month; you can gift your finished quilt to that special person in your life or give with love to a complete stranger who is in need of that connection and support. There is no pressure to keep up each month, some people are putting several themes into one quilt, others are only making a single block – all of that is fine, do what works for you and inspires you to be creative with what you have over the years collected with great intentions. Now it is time to use it all. Look into your cupboards, boxes and drawers to discover what partly made projects are there to be completed, or what fabric, ribbon, lace, thread or any other interesting items are waiting to be part of your next creation. Ask some friends to play along with you as we aim to use our ever growing stash and turn it into some interesting quilts. I have been enjoying using embroidery threads and adding sayings to several quilts, and I have plans to use a collection of bias, lace and ribbon soon. If you have any questions, you can email them to me.